One of the books which reached me too late for January in Japan was a review copy from Kurodahan Press, a small publisher based in Japan which, as well as publishing new translations, also brings out-of-print works back into English. While I was originally interested in a collection of stories by Osamu Dazai, one book which caught my eye was another short-story collection, one by a writer I hadn’t heard of before. 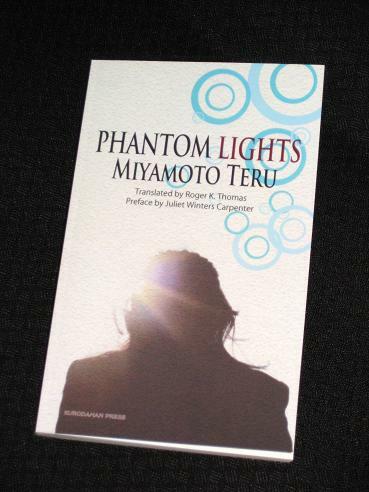 Teru Miyamoto is a writer from the Kansai region of Japan, and Phantom Lights (translated by Roger K. Thomas) is a collection of some of his more popular shorter works. Having won the Akutagawa Prize, Miyamoto is a well-known name in Japan, but there is little of his work available in English, apart from a novella (Kinshu: Autumn Brocade). In such an environment, it is little wonder that the future (and the story) is fairly bleak. The writer also looks back to his childhood, reminiscing about his school days. As you might imagine though, he rarely wears rose-tinted spectacles when thinking back to his youth. ‘Strength’ is a frame narrative in which an exhausted salaryman sitting on a park bench is reminded of his first school day by the sight of an elementary school student walking past with a bag on his back. In a fairly brief tale, the reader is shown not only the man’s first school day, but also a glimpse of his home life, one which may explain the situation he finds himself in today. Phantom Lights is an interesting collection, even if not all the stories are of the same quality. However, there were a couple of things that felt off. One was that the translation tended to be a little formal and stiff. The Kansai region is famed for its brashness and direct way of speaking, and while I agree with the translator (in his introduction) that this is impossible to get across completely, I’m not sure that the tone he adopted always worked. A lot of the stories were literally stories, told from one character to another, and the more conversational tone you would expect just didn’t happen. I also felt that, at times, it felt a little too autobiographical. Many of the stories were variations on a theme, examining Miyamoto’s early life from various angles, and while I have frequently read that this can be a trait of Japanese writing, it did get old a little quickly. In fact, where Miyamoto moved away from his own experiences more, the writing was often better. The best example of this was the title story, ‘Phantom Lights‘, the longest piece in the collection, and one that stands out for its quality and its difference. Narrated by a young widow who has moved to a remote seaside town to remarry, it tells of her struggle to understand why her first husband committed suicide, leaving her and their young son behind. The slower pace, and the different voice of the young widow, made for an enjoyable read, and it leads me to think that Miyamoto might actually be better enjoyed in a longer form.